Home > Ask Our Experts > Combination Pill vs Implant? Q.I read the information on hormone implants. 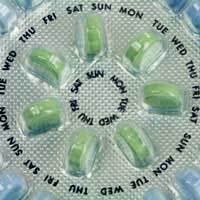 My doctor tells me that using the combination pill as a way of preparing me for fertility treatment would put me at a higher risk of a stroke. This is because I experience migraines with visual aura. Would an implant be a safer option for me? The hormone implant is a small device that is inserted under the skin (usually in the upper inner arm) and slowly releases hormones in the body. The aim of the hormone implant is to provide contraception as the hormones act in such a way on the body that the sperm find it very difficult to access the womb and by preventing ovulation so there are no eggs produced. As a contraceptive it is very effective but can carry some side-effects such as migraines, weight changes, disturbances to the menstrual cycle (some women have frequent break-through bleeding whilst others do not bleed at all and nausea and vomiting to name a few.As you already suffer from migraines this may not be a suitable option for you as your symptoms and frequency of events may increase. The oral contraceptive pill is now known for it's links with suffering as stroke particularly in women who smoke but there is not as much evidence demonstrating such a link when a smoker is using the hormone implant.The risk of stroke in those who suffer with migraine does appear to be higher especially if you experience visual aura, this risk is increased dramatically in those using the oral contraceptive pill so it makes sense that your doctor would probably be very reluctant to prescribe this for you. It isn't however as clear if there are any such studies relating to the use of the hormone implant and those who suffer with migraine and a possible link with having a stroke. There are however other possible reasons why the hormone implant may not be suitable for you. The implant can provide contraceptive cover for a period of several years, and as you mentioned the possibility of having fertility treatment in the future this again may not be the most suitable form of therapy for you at this particular point in time. There is a small chance of stroke if you are taking many forms of hormone treatment and these risks are increased significantly if you are over-weight, smoke, take illegal drugs or have had certain medical problems in the past. The best advice is to go back and have a lengthy discussion with your GP and discuss both your worries about migraine and stroke but also of your long term plans regarding your fertility.If necessary ask for a referral to a specialist such as a gynaecologist or a fertility expert who may be able to offer further advice. basically im so confused. I have had the implant for over a year, and have gained weight that im having difficulty in loosing, so now im doing drastic things like 2 meals a day and exercising most days if i really try. However, the worst thing is that i can get stressed, moody, angry or really depressed about things i never used to be too bothered about. Im putting this down to my implant, as loved ones seem to think ive changed. So ive arranged for my implanto be taken out next month and will go on the pill. However, will it all just start again?more weight gain and depression? im also worried about the prospect of forgetting to take my pill. HELP ME SOMBODY PLEASE!! I've got the implant in my arm but my GP put me on the pill too, as I have bad periods, but does it mean my rod won't work after I stop taking the pill or is it ok to keep taking it ?